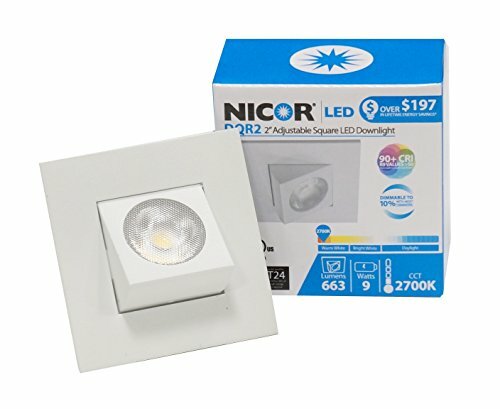 The NICOR Lighting 2-Inch Adjustable Square Eyeball 2700K LED Downlight Fixture for 2-Inch Recessed Housings, White (DQR2-AA-10-120-2K-WH) is part of the D-Series luminaries which offers a comprehensive family of LED downlight fixtures that complement one another no matter your design space needs. The new 2” family packs a punch with its small, elegant design along with its high lumen output. Not only does this family work perfect for accent and task lighting, but the lighting output allows you to bring general ambient lighting into a space with a very small, architectural exposure. From LED color rendering and trim finishes to fixture performance, this series is a perfect choice for commercial, retail, institutional, and residential applications. At NICOR, we’re always looking for ways to make your light better. We continue to innovate, challenge our thinking and improve our processes. We look to earn your business by delivering progressive lighting solutions designed to balance value with the highest design performance possible. We’re determined to bring you reliable products that provide real solutions. When you choose a NICOR product, you can rest assured you’re getting a product that has been tested to the highest standards available. Our commitment is to be a leader of reliability, innovation, and excellence because we understand just how important you are. LED Light Adjusts up to 30° to provide a custom lighting scheme. If you have any questions about this product by NICOR Lighting, contact us by completing and submitting the form below. If you are looking for a specif part number, please include it with your message.